So long as Playtonic doesn't have a publisher that agrees to finance all their games without gaining the IP in the process, it's better for them that they go to Kickstarter until they can stand on their own feet - thus avoiding the risk of going bankrupt the moment Playtonic makes a financial flop. I doubt that Team 17 would agree to fund games that requires tens of millions of dollars, and the money you make from crowdfunding is nowhere near enough of making AA/AAA games - that and a large portion of the collected money goes to pledge rewards/taxes/various other things which makes the budget for the game even smaller. And while Yooka-Laylee can be made with a small budget, other games that require things such as talented voice actors can not. Xellos wrote: While a Yooka-Twolee would be nice, or a spiritual successor to Conker and Jet Force Gemini - I would like to see something completely different than any of those games as Playtonic's next game. I hope that after Yooka-Laylee's massive success, they would collaborate with Gory Detail to revive Urchin - from the creative mind of Chris Seavor. The polar opposite of Yooka-Laylee, a very dark and depressing game starring a broken girl as she needs to survive against the unimaginable horrors of her world. It's not everyone's cup of tea, but if you can appreciate depressing games like American Mcgee's Alice that are also thought provoking at the same time, then you can see the potential Urchin has. Playtonic is one phone call away to make this cancelled game a reality, as Chris Seavor still wants to see his project getting released one day. I would pledge 150 euros to the hypothetical Kickstarter for Urchin, maybe more. That's how much I love this game to see the light of day. Sadly, Microsoft does own the copyright for Urchin - but there is a way of getting around that legal matter. Chris Seavor only needs to slightly alter the appearance of Lilith the main protagonist, other characters, and change the name of the game to something else than Urchin. See it as a 'spiritual successor' to a game that never materialized. They need an established line up before they do a Kart Racer. I'd say do 2ka-Laylee or a 2D platformer starring someone else. Don't forget this team had nothing to do with cbfd or perfect dark so a spiritual successor to these isn't likely. Scrubber wrote: Don't forget this team had nothing to do with cbfd or perfect dark so a spiritual successor to these isn't likely. Is that so? Guess again. This TEAM had nothing to do with cbfd or prefect dark. This TEAM did work TOGETHER on BK and DKC. I pledged this first project because a revival of "collectathon" 3D platformers was something I really hankered after for years, and I feared there would be no one in the industry to finance it. We'll see if they were wrong or right. But for fresh projects, hey, make your business plan targeted at more conventional stakeholders. What if they did a game that was totally unrelated to any genres they've worked on previously? That'd be wild, and I'm not sure it's something any Playtonic fan is expecting. I personally voted for a 2D platformer or Cart Racer next, but I would totally understand if the next thing they said was "our next game is a totally unique venture using <character list> from Yooka-Laylee. We want to do this so we're not spiritually succeeding every RARE game for the rest of our careers." YL makes a lot of sense, but it would also make sense if they don't want to live in a shadow and be RARE2.0 forever. Even being the Better Brother to RARE is different from standing on your own. Make the forum great again. The main reason a lot of us are super excited for Yooka Laylee is because we haven't had a 3D collectathon in over, what, 15 years? I don't think there would be as much excitement for a shooter or 3D cart racer because there's already plenty of those games in the market right now. Personally, I think Tooka Laylee is the best way to go. Maybe after that our appetites for 3D platformers will be satiated and they can do something new. I would love a spiritual successor to Conker, but part of me thinks Chris Seavor is the only person in the world who can do it. BanjoThreeie wrote: I would love a spiritual successor to Conker, but part of me thinks Chris Seavor is the only person in the world who can do it. Then you will be disappointed to hear that Chris Seavor is done with making games like Conker's Bad Fur Day. He's nowadays more interested in making dark and depressing games like Rusty Pup, and one day Urchin. I know. I never said it would ever happen. A man can dream, though. A diddy kong racing successor would be ace! loved that game esp the adventure mode, you just know these guys would make an ace job of of too! Yooka Laylee Racing has to happen! I mean, it doesn't have to be a 1:1 spiritual successor to Diddy Kong Racing. Just like Yooka-Laylee, I expect a proper evolution of their vision of a fun racer. The only thing I would like to insist on is the three types of vehicles (karts, hovercrafts, planes) in some way and an adventure mode with an overworld. Everything else, like the controls (oh they better make the controls better ) and the gameplay can vary and evolve to whatever they like to. Oh, but the upgradable-item system was pretty genius as well. Rareware/Playtonic were/are probably the only ones that can deliver an experience on the same or higher (high) level of a Mario Kart. And the DKR formula deserves a proper evolution. Who will do that, if not Playtonic? Who knows, maybe they even gain Nintendo's trust to directly do a DKR sequel with Nintendo / Playtonic characters instead of Banjo and Conker (whenever that will be, that is). I would love that. I suspect the company will want to diversify and do something totally unrelated to platforming for a second game. Maybe a Killer Instinct-type fighter? "Untwerwegs in Düsterburg" an great Adventure, full of sarcasm, humor and adventuring! Wow. I mean, that's brilliant banter on one level, but it shows that Playtonic IS talking with Retro (a Nintendo subsidiary). NPChilla wrote: Wow. I mean, that's brilliant banter on one level, but it shows that Playtonic IS talking with Retro (a Nintendo subsidiary). You´re right i totally forgot, that they promoted Super Mario Maker back then! That would be so awesome, if they are collaborate to make a new 3D Platformer Donkey Kong, or even "just" a new 2D Counry game. 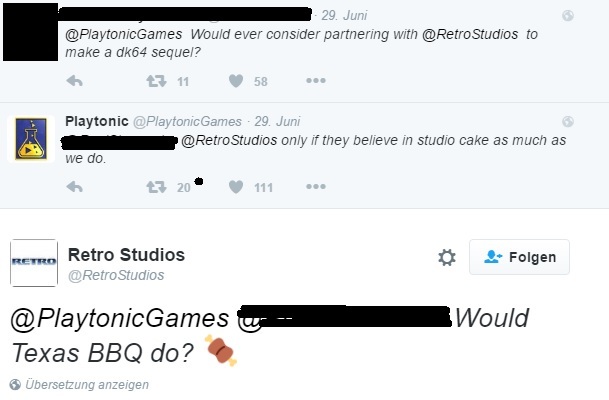 Either way, with Playtonic on board it´s going to ROCK! Thought I'd revive this topic to say one game I'd love to see come to fuition: a variation/spiritual successor to Dinosaur Planet, one of Rare's greatest lost gems. I'm playing through Star Fox Adventures at the moment, and as much as I like it, I get sadder the more I play it knowing what it was going to be before Miyamoto came in and botched it just because of a few similarities between the protagonist and Fox. Watching the pre-release footage, reading the condensed story on MundoRare and listening to all the voice acting from Dinosaur Planet hinted at just how interesting it would have been. It's the strongest written story I've heard from Rare and it kills me to know I'll never experience the original game as intended. On that note, Kyte would have been my favourite character. If you know the original story, Kyte's tale would have been very bittersweet. I'd say the next logical step, after a Banjo-Kazooie inspired game would be a Donkey Kong Country inspired game, but then again, it's not like people are begging for that kind of game the way they were a 3D platformer collect-a-thon (thank you Retro Studios)... Perhaps a raunchy 3D platformer like Conkey's Bad Fur Day? Or a racing game like Diddy Kong Racing? How about a first-person shooter stealth game like Perfect Dark? Maybe a fighting game like Killer Instinct? Maybe something totally off-the-walls crazy like Blast Corps? Personally, I'd like to see a Diddy Kong Racing or Blast Corps kind of game the most! ...A Man can dream... Project Dream, that is.